Education Qualification : Passed Diploma/ITI/B.Sc/B.ElEd/B.Tech/B.Ed/UG/PG Degree in Relevant Stream from any Recognized university/Institution, (Note- For Complete Details about Eligibility Please Check Official Notification). Eligible Candidates can Submit Application at the Official Website of HPSSSB latest by 4th August 2018. 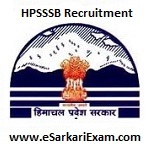 Applicants First Logon to HPSSSB Official Website. Open Advertisement No. 34-1/2018 Link.